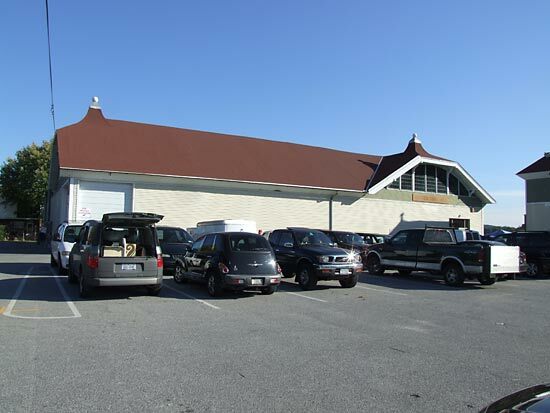 Location: Horticultural Hall, York County Fairgrounds, Carlisle Road, York, PA, USA. 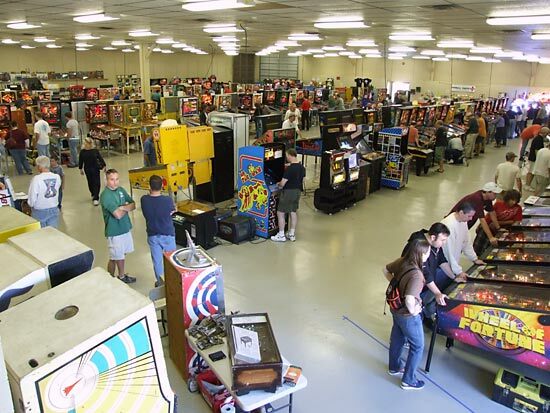 The White Rose Gameroom Show was back in it's familiar surroundings of the Horticultural Hall at the State Fairgrounds in York, Pennsylvania and held this year on Friday 10th and Saturday 11th October. Despite earlier forecasts of rain, both days were beautifully sunny and warm, making one of the highlights of the event all the more attractive. 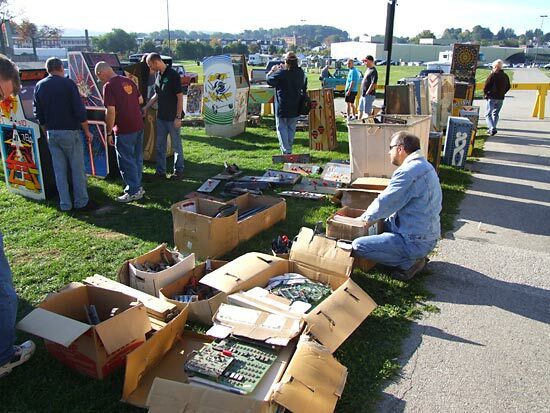 The outdoors flea market is a traditional place to pick up all kinds of pinball and arcade bric-a-brac, ranging from complete games to the smallest plastics. Our trip to York meant we didn't arrive until mid-afternoon on Friday but the flea market was still in full swing and it continued until darkness began to descend. 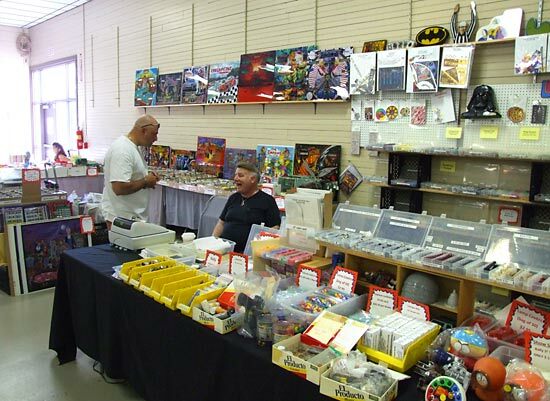 Saturday's turnout looked to be even greater with some new vendors and replenished stock for the returnees. There were some very tempting bargains although the prospect of squeezing a $500 Striker Xtreme into the overhead bin on the plane ruled out that particular deal, but there were plenty of others of a more manageable size including translites, flyers and even those stop signs Red holds up on the Roadshow backglass. While the flea market was in full swing outside, the main show was getting underway inside the Horticultural Hall. Entry to this cost $15 a day, or there was an advance purchase ticket for both days which saved $5. Entry also included a prize draw ticket which was deposited in a tub at the back of the hall for inclusion in both the regular door prize draws which took place throughout both days, and the main draw for a Gottlieb Gold Wings held near the end of the show at 5pm on Saturday. 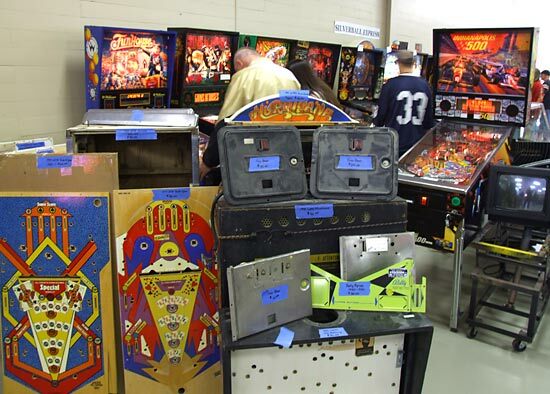 From first impressions it appeared there were significantly fewer machines present this year compared to last but in fact, after making a list of all the games on the floor on Friday evening, the numbers are very close. In 2007 there were 159 while this year there were 153, so initial impressions can be deceptive. 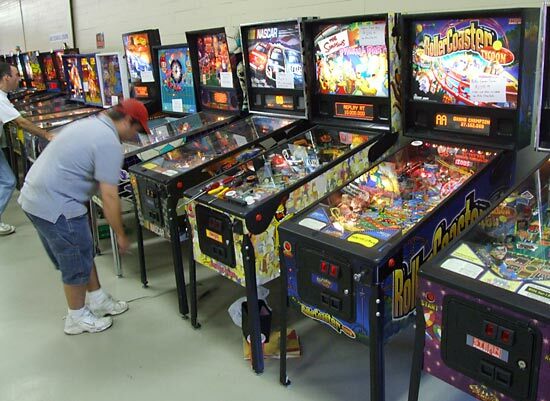 Here's the list of machines set up for public play this year. As ever, games were sold and new ones brought in throughout the show so this is only a snapshot of what was available on Friday evening. 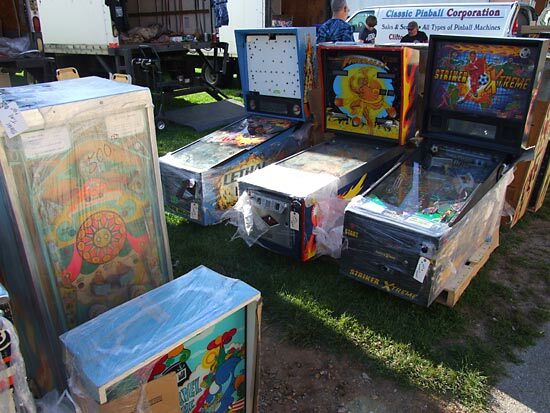 Some additional games on vendors' stands were not set on free play and are not included here. 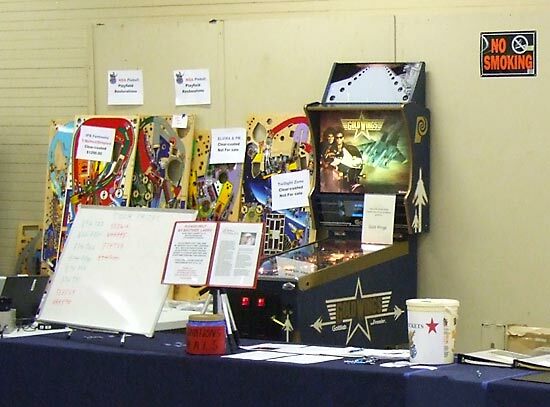 There were also two bingo machines brought by Jeffrey Lawton - Sea Island and Malibu Beach - who was on hand to advise visitors about how to play them. In addition, there was this Williams Gold Mine bowler. 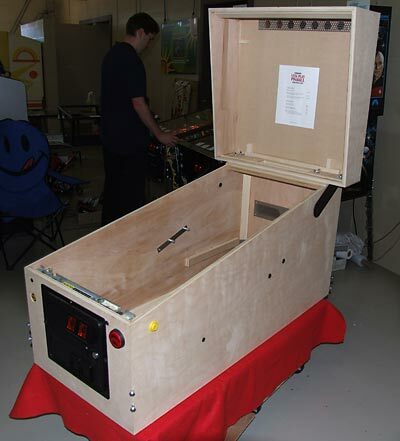 One of the newest products on display was this bare wood Williams WPC-style cabinet from Let's Play Pinball. The cabinets and heads are available either complete or as individual parts, with or without various fittings and can also be supplied with new cabinet decals applied. Prices range from $750 for the basic bare cabinet and head up to $1300 for a fully finished one with your own decals fitted. 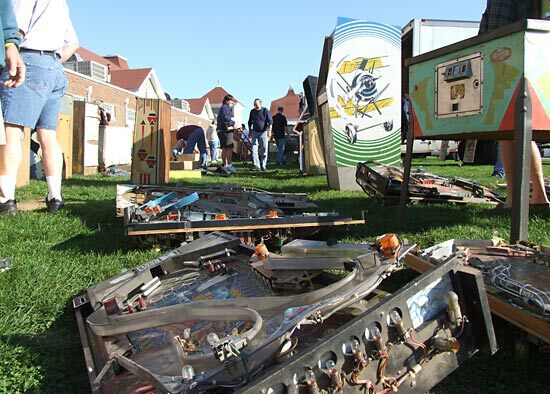 There was a good selection of pinball parts available along with the usual neon signs, brewing and bar collectibles, slot machines, LEDs, playfields and translites. 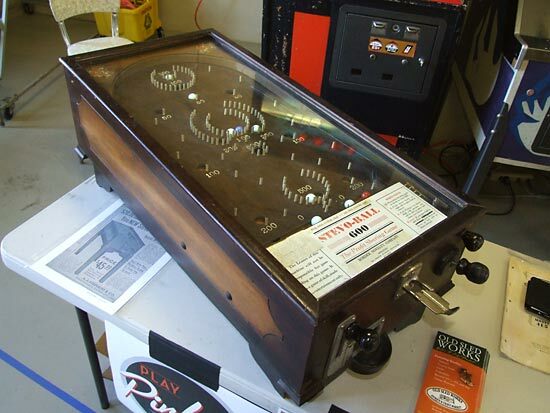 Jimmy Rosen of The Old Sled works was showing a few interesting pieces including two upright shaker pinball machines and this pre-war mechanical payout machine from 1931. You can take a look around the hall yourself with our exclusive Three Minute Tour. Just click on the image below to play the video. 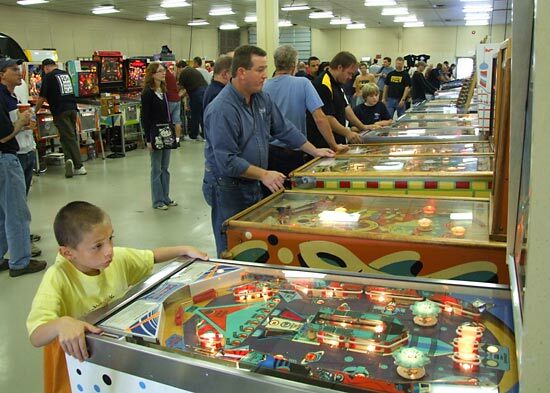 A number of pinball tournaments were also held across both days. 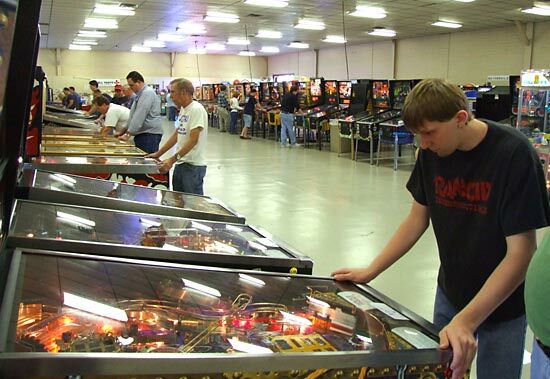 On Friday there was a mechanical pinball tournament and a ladies' tournament while on Saturday there was a split-flipper, a kids and an electronic pinball tournament. Sadly, we had to fly out before these tournaments were all completed, but here are the results of all five competitions. 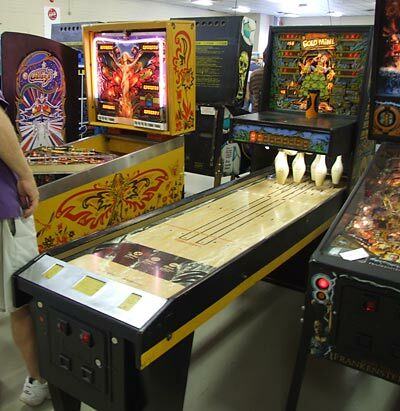 The White Rose Gameroom Show still maintains that friendly, less hectic feeling, allowing visitors to explore the games, the flea market and the vendors' offerings at their own pace. 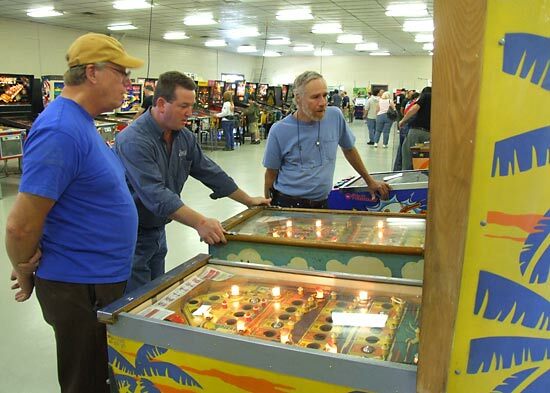 Even the tournaments have a laid-back, casual feel where anyone wandering up as the last games are played, still has the chance to try their luck. 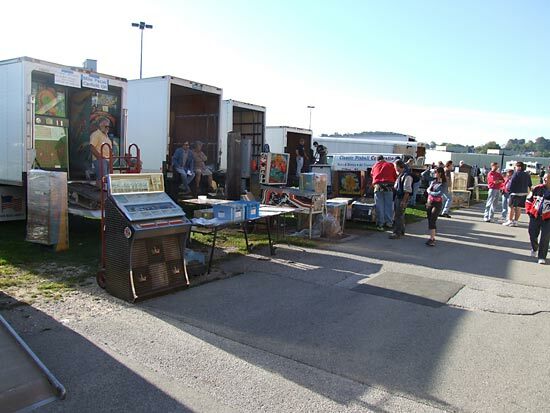 Each tournament, like the flea market, is free to enter. By holding the show on a Friday and Saturday, rather than the more usual Saturday/Sunday means there is less of a rush to clear away games and pack up stalls on the second day. Several shows are denuded by mid-afternoon of their closing day but because the day after the White Rose show is a Sunday, there's no rush out of the hall as the close approaches. 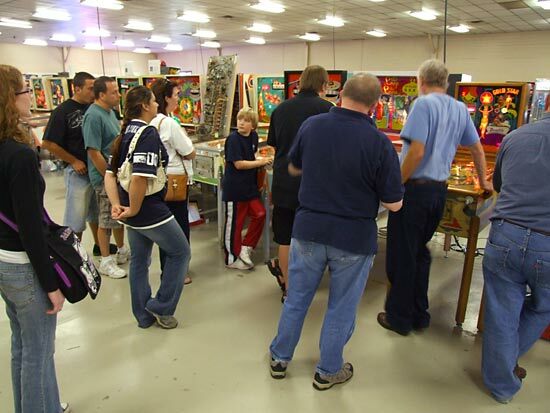 Having more time also encourages more conversations with fellow visitors, turning the show into as much a social event as a game-playing one. As ever, there are always a few improvements possible. The overhead lighting causes many reflections on the games in the hall. It may not be possible to selectively switch groups of lights on and off in order to keep the vendor stands well lit but it does cause some problems when playing. Secondly, the public address system is virtually inaudible much of the time and doesn't extend into the flea market or outside the hall where many of the visitors congregate, causing them to miss the announcements about special events or tournaments starting. Other than those minor issues though, the White Rose Gameroom Show continues to provide an excellent selection of machines, well maintained and many interesting and rare games to enjoy. Congratulations to the organisers Marlin and Eric, everyone who helped run the show, the vendors and all those who brought games and kept them maintained across the two days.